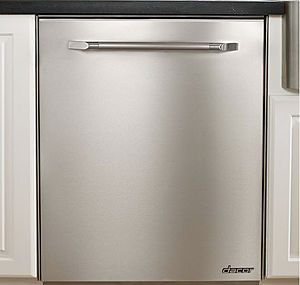 In-wall dishwasher, design solution that combines practicality and good looks. The built-in dishwasher requires a niche for its installation. This common kitchen appliance offers numerous options. Models with interchangeable face plates can be altered to match kitchen decor. Some studies indicate dishwashers use less water than hand washing. Choice will depend on home or commercial use, capacity, available space and energy consumption. American machines carry Energy Star ratings, while the European Union uses the term Eco-label.